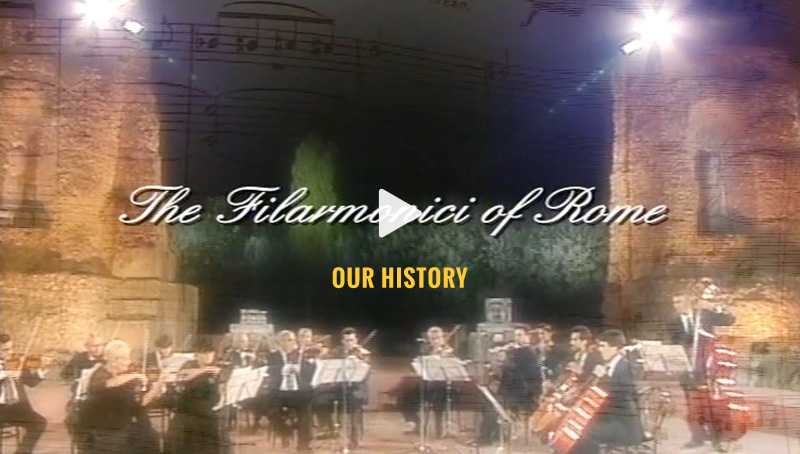 The chamber orchestra "I Filarmonici di Roma" was founded by its president,Professor Guido Casarano in 1976. Together with some colleagues-members of the "Ente Ceciliano, he created the Santa Cecilia Chamber Orchestra Association.From its first performance, the new formation was met with acclaim by critics and public alike. It has played concerts under the direction of many directors, among which, Sawallisch, Pretre, Metha, Zecchi and Menuhin and soloist as Milstein, Menuhin, Stefanato, Asciolla, Campanella, Vasary, Gazzelloni, Szeryng, Rostropovic. Actually it is carrying out an intense activity with Uto Ughi and it offers a vast repertoire that spaces from the Baroque music to the contemporary one, and that can be played in different formations. It collaborates with the most important societies of concert taking part to initiative of deep humanitarian sense promoted by Amnesty International, by the Association for the Research against Cancer, by Mother Therese of Calcutta, by the Italian Red Cross and by the FAO. It recorded for the State Disco and for the Radiotelevisione Italiana. With Uto Ughi it has recorded the integral version of concerts for violin of Mozart for the RCA Victor Red Scal and six Vivaldi’s Concerts for the BMG-Ricordi. Recently it records for Sony the disc “Violino Romantico” (“Romantic Violin”). In Venice he took part to the event celebrating the century from the birth of Respighi, at the Festival “Homage to Venice” in honor of Arthur Rubinstein and at the Award “Una vita per la musica” (“One life for the music”) in honor of Carlo Maria Giulini. For “Homage to Rome”, over that with Uto Ughi, it has played with Rostropovitch. Very important are the tours abroad, among which particularly meaningful are those in Mexico; Canada, where it took part to the festival “Italy in Canada” representing Italy under the aegis of the Academy of Santa Cecilia; Beirut, in occasion of the celebration for the 50th anniversary of the liberation of Lebanon; Madrid, for the Festival of Otoño; India (Delhi, Calcutta, Bombay); Greece with Michele Campanella; Zagreb where it has inaugurate the concert season 1996/1997. In 1997 again in India, with Uto Ughi, under invitation of the Italian Ministry of the Foreign Affairs for the 50th anniversary of the independence of the Nation; Boston, representing the European Parliament and after at the Lincoln Center of New York with the cellist Enrico Dindo and in 2005 at the Carnegie Hall with Ughi. After two tours in Japan, of which one in occasion of the event “Italia in Giappone 2001- 2002” (“Italy in Japan” 2001-2002),the Orchestra has played concerts in Middle East (Cairo, Damascus, Cyprus, Beirut, Lebanon), in Thailand and in Burma, where it has been the first occidental orchestra to perform inside the Nation. In 2007 in Moscow, inside the prestigious Tchaikovsky Hall, and in the most important Russian towns and in the all the main towns of all the Baltic States. “To the Orchestra I Filarmonici di Roma that has elevated at the highest level the expression of the Italian music all over the world”.